We’ve taken our popular Biotherapy™ Skincare soap to new depths of cleansing by adding activated charcoal to the original formula. 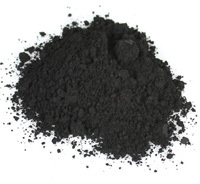 Because activated charcoal removes impurities, it can help reduce the instances of acne and other skin problems. It works wonders for thoroughly removing makeup. You can use it all over your body. Note: charcoal can discolor a light colored washcloth. The soap is pleasantly scented. It contains essential oils of tea tree, palmarosa, lavender, geranium, patchouli, and vetiver, to balance your skin's oil production, whether you have dry or oily skin. It also contains finely ground oatmeal, though you won't see it. Oatmeal helps cleanse, soothe and moisturize your skin. We've superfatted the soap with jojoba oil, a noncomedogenic moisturizer, which will soften your skin without clogging pores. Activated charcoal is effective due to its absorptive powers from increased porosity. “I am 5 months pregnant, and was my skin on the fritz! Nothing was working. My mom told me about the Biotherapy and I thought I may as well try it out, but wasn't very optimistic; after all, I had tried so many topical solutions already. Try the Biotherapy Black Luffa Soap, also. Try the original Biotherapy Skincare soap. If you like our Biotherapy Black soap, try our Biotherapy™ Beauty Collection.